The owner of the holding company that controls South Korea’s Nexon is putting his controlling stake in the company up for sale, and Chinese gaming giant Tencent is considering buying it up. Kim Jung-ju, Nexon’s founder, has announced he is selling his 98.64% stake in NXC Corp, the holding firm that controls Nexon, according to reporting by the Korea Economic Daily. Now, two sources have told Reuters that Tencent is considering making an offer on the stake, which is worth around $8 billion USD (£6.2 billion). That would give Tencent control of Dungeon & Fighter, a Nexon game for which Tencent owns the Chinese publishing rights, and for which it pays royalties to Nexon. Nexon’s portfolio includes hugely popular games like MapleStory and KartRider, and it also works with EA to publish its sports titles in Korea. For its part, Tencent has been buying shares in gaming companies that span the spectrum of publishers and development. It owns a 10% stake in PlayerUnknown’s Battlegrounds publisher Bluehole, a 9% share of Elite: Dangerous developer Frontier Developments, and 36% of Fatshark, the developer behind Vermintide – just to name a few. Tencent also holds a 40% stake in Epic Games, and Fortnite is set to launch on the international version of its games distribution platform WeGame. It’s one of China’s most valuable companies, and worth more than Wells-Fargo. 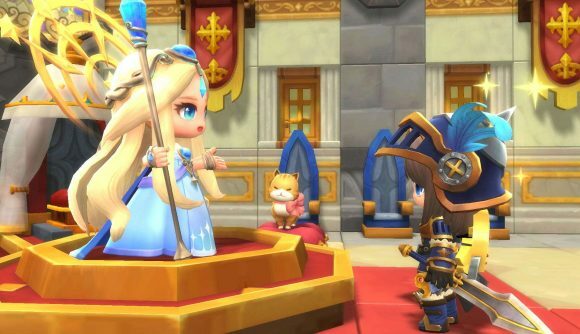 Reuters’ sources say private equity firms are currently involved in shaping a deal, which might involve taking the publicly-listed Nexon private. But Tencent aren’t the only potential buyers – GamesIndustry.biz reports that other potential investors include EA, Disney, and Activision. The sale is scheduled to take place in October at a presentation session in San Francisco.